The below artworks are the most important in Concrete Art - that both overview the major ideas of the movement, and highlight the greatest achievements by each artist in Concrete Art. Don't forget to visit the artist overview pages of the artists that interest you. 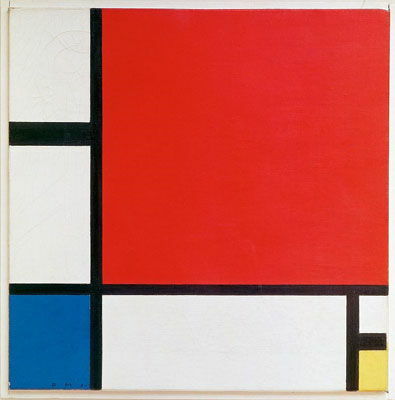 Artwork description & Analysis: Though this painting was not conceived as a work of Concrete Art, Mondrian's vision of a universal compositional language rooted in a minimum of elements - horizontal and vertical black lines framing squares of white, red, yellow, and blue - summed up the spirit of Concretism avant-la-lettre. Moreover, the earliest works of Concrete Art were imbued with the spirit of Neo-Plasticism, and took their impetus from a manifesto penned by Mondrian's sometime compatriot Theo van Doesburg in 1930. In 1960, Max Bill mounted the exhibition Konkrete Kunst in Zurich in order to celebrate 50 years of Concrete Art's development, suggesting that the movement's primary polemicist was happy to incorporate early twentieth-century artists into its heritage. A quintessential work of mid-century Concrete Art will often consist in the methodical visual expression of a mathematical formula. In a comparable spirit, Mondrian's Composition with Red Blue and Yellow was intended to express the mathematical forces underpinning all of sensory reality. In particular, the early development of Neo-Plasticism was heavily influenced by the Theosophist and Mathematician M.H.J. Schoenmaker's 1916 text Principles of Plastic Mathematics, in which he declared: "[t]he two fundamental and absolute extremes that shape our planet are: on the one hand the line of the horizontal force, namely the trajectory of the Earth around the Sun, and on the other vertical and essentially spatial movement of the rays that issue from the center of the Sun...the three essential colors are yellow, blue, and red." We can see the results of this statement borne out in Mondrian's ascetic, non-symmetrical construction, in which abstract compositional elements come to stand for the essence of all life, while eschewing all specific subject-matter. In the works of Concrete Art produced in Europe and Latin America over the coming decades, this principle would be redefined through a more materialist worldview, and through more vibrant combinations of color and shape. Artwork description & Analysis: In 1934, Max Bill, then in the early stages of defining the Concrete Art movement, began a series of artworks based on a simple geometrical exercise. He created an unfinished equilateral triangle whose third side would protrude out at a different angle to create a square, whose fourth side would protrude out at a different angle to create a pentagon, and so on (potentially ad infinitum, though Bill's formula stopped at the octagon). This simple mathematical principle was used as the basis for a series of lithographs which expressed the concept in a number of different ways: for example, by creating circles connecting up the shape's implied corners. In 1938 he published the series, asserting in his introduction to the Variations that "concrete art holds an infinite number of possibilities", even though "[s]uch constructions are developed only on the basis of their given conditions and without any arbitrary attempt to modify them." This, in a nutshell, sums up the spirit of Concrete Art. Artworks were to be created which would express nothing more than the logic of their own creation, and yet within these rigid compositional constraints, as Bill put it, "an infinite number of very different developments can be evolved according to individual inclination and temperament." The large-scale series was a primary vehicle for this idea, and Bill created many serial works throughout his life, Fifteen Variations on a Single Theme (1934-38) being the first. This particular series also reflects his keen interest in color combinations. He had studied at the Bauhaus in the late 1920s under Josef Albers, the primary theorist of color in twentieth-century art. As vital to this work as its playful exploitation of geometrical constraints are the risks taken with tonal harmonies, with purples, oranges, greens, and pinks introduced into the primary color-palette in a number of the variations. In 1937, during the creation of his Fifteen Variations, Bill founded the Allianz group of Concrete Artists in Switzerland, with compatriots including Richard Paul Lohse and Leo Leuppi. The Allianz Group was the first of many such Concrete Art collectives to spring up across the world during the 1930s-50s. Indeed, Concrete Art became as defined by its collectivist, internationalist spirit as by its commitment to compositional formulas. Artwork description & Analysis: Max Bill was a sculptor, architect, and industrial designer as well as a painter. Indeed, his creative career, like that of his Argentine peer Tomás Maldonado, marked a gradual movement away from the canvas towards evermore large-scale and functional realisations of his principles. An early staging post on this journey was the creation in 1935 of his first Endless Ribbon sculpture, a later recreation of which is shown here. 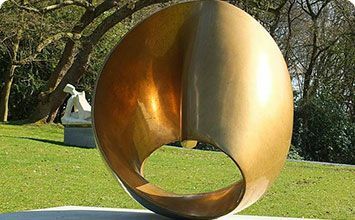 Based on the principle of the Möbius strip - a ribbon whose two surfaces run into each other - the series would occupy Bill continuously until his death in 1994, incorporating works in paper, metal, and stone. In 1935, Bill was invited to design a sculpture to hang above an electric fireplace, potentially to be rotated gently by the upwards surge of hot air. He struck on the idea of a ribbon-shape whose opposing sides would merge with one another, mesmerized by this neat visual evocation of a mathematical conundrum. 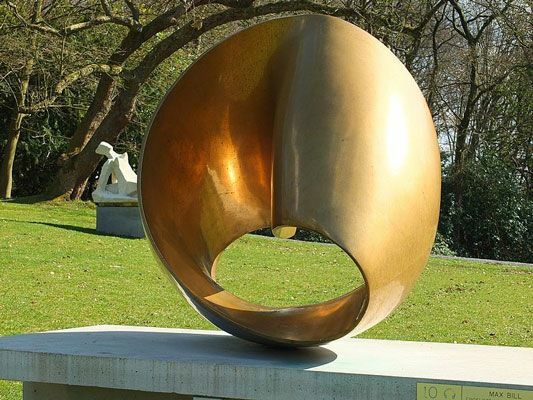 It was only after the work's completion that viewers informed him of its connection both to the Möbius strip and to the traditional figure-of-eight symbol for infinity. It is also easy to see the work as speaking to the recent discovery of space-time relativity, whereby two seemingly separate aspects of reality were revealed to be intimately related and interdependent. If Concrete Art on the page was defined by playful, permutational works, in three dimensions it had the capacity to express mathematical and scientific concepts with a more singular and static grandeur. In later years, South American artists such as Gyula Kosice would advance this project by producing Kinetic Artworks influenced by the spirit of Concretism. Bill's Endless Ribbon stands at the forefront of such advances, evoking timeless and contemporary themes with an imposing grace. Artwork description & Analysis: In this quintessential work of mid-century Concrete Art, Richard Paul Lohse, one of the co-founders of the Allianz Group, uses the canvas to express various visual possibilities of a methodical compositional formula. The canvas comprises a 4x4 grid of squares, each square consisting of three further, rectangular strips, with five different colors (blue, green, orange, pink, yellow) used to fill those strips, blue to appear in every square, the other four colors in every other. Further, complex principles of rearrangement and repetition define the terms of each color's appearance across the grid. The final effect of this formulaic process is, oddly enough, not stultifying but enticing, evoking something of the pleasure taken in pure logic and pattern, while eschewing all figurative content and precise suggestion of individual emotion. Born in Zurich in 1902, Lohse trained as an advertising artist and graphic designer before co-founding the Allianz Group in 1937 with Leo Leuppi and Max Bill. 1943 marked a breakthrough year for Lohse, as he began to develop a range of algebraic systems through which he could compose his artworks. Some expressed in visual form the equivalent of the 'magic square' (a grid filled with numbers in which all possible horizontal and vertical sums add up to the same total). Others, like this piece, are based on a compositional logic requiring more concerted deciphering. Like Bill and the other Allianz artists, Lohse was also interested in exploring new color combinations; in this work we can sense the palette of Neo-Plasticism being expanded in exciting new ways, perhaps expressing something of the vibrancy of modern commercial design and advertising. Lohse was also a politically committed artist, involved in the resistance movement during the Second World War. As such, he believed in the power of art's universal languages to foster intercultural harmony. Writing in 1988, Donald Judd surmised that "[t]he attitudes implicit in Lohse's work, including strong and still radical ideas about society, are very interesting, both as to what is older and what newer....In Lohse's work there is the end of the European compositional tradition, a good end, and also there is the beginning of much that is still beginning to develop." Artwork description & Analysis: This characteristic early work of Latin-American Concrete Art suggests the influence both of Max Bill's grid and systems-based composition and the spiritual abstraction of Wassily Kandinsky (who penned his own manifesto for "Concrete Art" in 1938). The title of the work translates as "Development of a Triangle", and we can almost 'read' the painting, starting at top-left, as a series of developments within a single line, dividing and diverging to form a number of triangular or proto-triangular shapes as it descends the canvas. As a co-founder of the Asociación Arte Concreto-Invencíon in Buenos Aires in 1945, Tomás Maldonado was associated with that wing of the Argentine movement that remained more committed to the compositional constraints and formulas of European predecessors such as Mondrian and Van Doesburg. Nonetheless, the "system" underpinning this composition seems loose and improvisational, suggesting the scope for imaginative play within the limits Maldonado set himself. Born in Buenos Aires in 1922, Maldonado rose to prominence through his co-editorship of the journal Arturo in 1944, the creative collaborations around which led to the founding of the Concreto-Invencíon and Arte-Madí groups over the following two years. Maldonado's artistic sensibility was entwined with his Marxist politics, and his sense that art ought to serve a functional purpose in society ultimately led him to abandon art for industrial design, just as his European peer Max Bill did. By this point Maldonado was working with Bill as one of the original faculty members of the Hochschule für Gestaltung in Ulm. Maldonado later recalled that it was his desire to assist with the reconstruction of war-ravaged Germany that compelled him to abandon painting in favour of more socially useful pursuits. Maldonado is best remembered today for his achievements as a designer and teacher at Ulm: through his work devising the school's "foundational course" he assumed a similar relationship to Bill, the school's rector, as László Moholy-Nagy had to Walter Gropius at the Bauhaus. However, Maldonado's early work as a painter and polemicist played a vital role in sparking off the Concrete Art movement in Latin America. His return to painting in the final two decades of his life shows how creatively significant it remained for him throughout his career. Artwork description & Analysis: Rhod Rothfuss's Madí Painting epitomizes the spirit of the eponymous group that he co-founded with Gyula Kosice and Carmelo Arden Quin in 1946. An irregularly shaped wooden board serves as the canvas, adorned with wild, mobile-seeming shapes, picked out in bright enamel. Though certainly a work of geometrical abstraction, Pintura Madí epitomizes the more anarchic spirit of the Arte Madí group as compared to Maldonado and the Concreto-Invencíon collective. Lines are more likely to be slant, with shapes echoing the seemingly random dimensions of the canvas, suggesting a creative process more open to chance and coincidence. Born, like his Madí-group compatriot Carmelo Arden Quin, in Uruguay, Rothfuss moved to Buenos Aires in 1942, and was involved in producing the single issue of Arturo in 1944. After an initial period of collaboration with the Concreto-Invencíon artists, the two Uruguayan painters seceded, along with the Hungarian-born Gyula Kosice to form a group dedicated to the more ludic possibilities of Concretism. Quin and Rothfuss's work from the 1940s to the 1960s bears striking resemblances, suggesting a crucible of collective activity. Quin, like Rothfuss, created boldly colorful works on irregular wooden canvases suggesting a passing debt to the legacy of Central-American Muralism. Kosice, meanwhile, was an early innovator in Kinetic and Mechanical Art. Rothfuss died in 1969, by which time the Madí group's initial period of creative ferment had come to an end. But its legacy had already been felt in the emergence of Neo-Concretism in Brazil at the close of the 1950s. This reflected a yearning amongst some South-American artists for a more intuitive, playful creative process than the constraints of Concretism yet allowed. Artwork description & Analysis: In many ways, Concrete Art remained more restricted to the traditional media of fine art - painting, sculpture - than its ancestral movement, Constructivism. While Constructivist artists such as Alexander Rodchenko always yearned to integrate art with functional design, Concrete Art was more likely to concern itself with the visual expression of abstract mathematical formulas, in an effort to remove itself entirely from the realm of figurative representation. Its "function", in this sense, was to assume a kind of autonomous presence in the world rather than to perform a useful task. But this was not always the case: many Concrete Artists, including the grandfather of the movement Max Bill, were also prolific industrial and commercial designers. In the world of functional design, the goal Concrete Artists were more likely to set themselves was how to solve a given design problem using the minimum number of functional elements and constructive maneuvers. 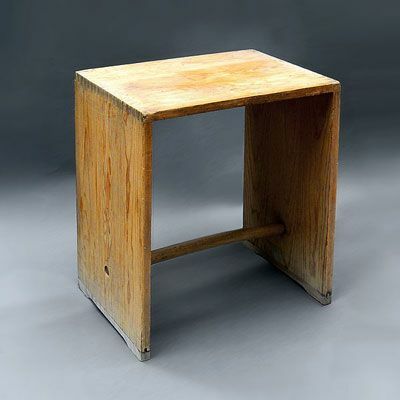 Nowhere is this ideal borne out more clearly than in the design of Bill's iconic Ulm Stool, created in 1954 for the students and faculty of the new Hochschule für Gestaltung. Intended to double as a wall-mounted storage unit, it is a masterwork of mid-century modernist design, achieving with an absolute minimum of physical parts and simplicity of construction in a versatile and functional form. If the influence of Concrete Art in the world of painting and sculpture was in the emergence of Neo-Concretism and Minimalism in the 1960s, its legacy in the world of design can still be felt. It was at Ulm that the first examples of what we now call flat-pack furniture were created, for example, while its unprecedented focus on ergonomics and visual semiotics continues to inform commercial product design. Artwork description & Analysis: Eugen Gomringer's famous poem "Silence" - reprinted in a range of languages including Spanish, German, English and Hebrew since its composition in 1953 - represents an early attempt to resolve a seemingly impossible conundrum: how to bring the non-representative quality of Concrete Art to the medium of language. Words, more than visual or sculptural forms, must by definition refer to something other than themselves: so in attempting to make Concrete Poems, writers such as Gomringer were in a sense forced to reframe the terms of the problem. Works like Silence became exercises in exacting linguistic minimalism, radically reducing the semantic components used to convey their themes: in this case the idea or feeling of silence. At the same time, Concrete Poems assumed something of the visual or sculptural presence of Concrete Art through their appearance on the page: in grid-like or permutational patterns which drew attention to words and letters as things in themselves. Born in 1925, the Swiss-Bolivian poet Eugen Gomringer was working at the Hochschule für Gestaltung in Ulm as secretary to Max Bill in 1955 when he established the international Concrete Poetry movement via long-distance communication with the Brazilian poets of the Noigandres group. Like Gomringer, the Brazilian poets had been forging the creative principles underpinning Concrete Poetry since the start of the decade, but their collective coinage of the term prompted the emergence of an international literary movement, spreading from South America to Japan. While the Noigandres poets were politically motivated and rationalist in their outlook, Gomringer's work generally offered a more spiritual, meditative vision. The task that the first Concrete Poets set themselves - to bring to language the same clarity of form as a Concrete Artwork - ultimately proved to be nearly impossible. Nonetheless, the melding of Concrete Art's aesthetics with the literary heritage which its newfound advocates could draw on, resulted in a unique and fruitful development within the genre. Eugen Gomringer himself remains active, at 94, as the head of the Institut für Konstruktive Kunst und Konkrete Poesie in Rehau, Germany. Artwork description & Analysis: Lygia Clark's Bichos series (sometimes translated as "Little Beasts") are generally dated to the period between 1960 and 1964, shortly after Clark attached herself to the "Neo-Concrete" movement. A series of palm-sized sculptures constructed from hinged planes of aluminium, they are designed to be manipulated in the hand by the viewer. In these works, the principles of Concrete Art are pushed to a point of creative rupture. Though remaining (almost) in the realm of non-figurative abstraction, the construction process proceeds from an intuitive, sensory engagement with material and shape rather than a rational mathematical formula, while the viewer's (literal, physical) interaction with the work becomes vital to its final form, as they move the hinges and flaps to find a favorable position. Born in Belo Horizonte, Brazil in 1920, Clark was involved with Lygia Pape and Hélio Oiticica in the formation of the Carioca art collective Grupo Frente in 1952. This, along with the formation in the same year of the Ruptura group in São Paulo, signified the emergence of a coherent Concrete Art movement in Brazil. But Clark and her colleagues were more inclined towards phenomenological, non-rational engagement with their materials and structures than Ruptura artists such as Geraldo de Barros. They were also more interested in the creative role of the viewer. Acting on these principles, at the close of the decade, Clark began exhibiting works such as the Bichos under the banner of "Neo-Concretism". One significant expression of her movement away from the strict abstraction of early Brazilian Concretism is the readmission of figurative suggestion into this work. Describing her army of little sculptures as beasts or critters, she likened the aluminium hinges to back-bones, as if endowing them with the pulse or spark of organic life. In the years following the demise of the Concrete Art movement, Clark and her Neo-Concretist peers have ironically achieved far greater fame than the artists whose orthodoxy they supplanted. Clark's ideas of viewer-interaction and sensory hermeneutics, interdisciplinarity and the endless slippage of meaning from viewer to viewer, have proved more amenable to the landscape of subsequent contemporary art than the earnest rationalism of some of her peers. It goes without saying that her work also has value in kicking against an ideal of rational impersonality defined - as such ideals generally are - by male artists. Nonetheless, her work still emerged from, and stands as a monument to, the creative vigor of Concrete Art.